حسینی, سید علی, احمدی, امین, عاملی, علیرضا. (1397). ارزیابی حساسیت رطوبتی و مقاومت شیارشدگی مخلوط‌های آسفالت گرم حاوی الیاف شیشه با استفاده از دستگاه چرخ محرک. پژوهشنامه حمل و نقل, 15(4), 247-261. سید علی حسینی; امین احمدی; علیرضا عاملی. "ارزیابی حساسیت رطوبتی و مقاومت شیارشدگی مخلوط‌های آسفالت گرم حاوی الیاف شیشه با استفاده از دستگاه چرخ محرک". پژوهشنامه حمل و نقل, 15, 4, 1397, 247-261. حسینی, سید علی, احمدی, امین, عاملی, علیرضا. (1397). 'ارزیابی حساسیت رطوبتی و مقاومت شیارشدگی مخلوط‌های آسفالت گرم حاوی الیاف شیشه با استفاده از دستگاه چرخ محرک', پژوهشنامه حمل و نقل, 15(4), pp. 247-261. حسینی, سید علی, احمدی, امین, عاملی, علیرضا. ارزیابی حساسیت رطوبتی و مقاومت شیارشدگی مخلوط‌های آسفالت گرم حاوی الیاف شیشه با استفاده از دستگاه چرخ محرک. 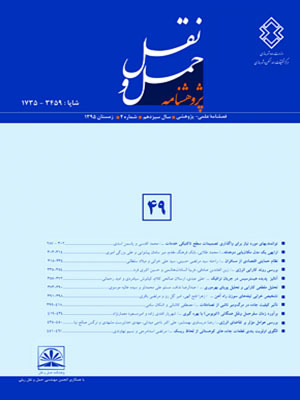 پژوهشنامه حمل و نقل, 1397; 15(4): 247-261. با افزایش روز افزون الزامات زیست محیطی و کمبود منابع مالی، بررسی عملکرد مخلوط‌های آسفالتی گرم بیش از هر زمان دیگری مورد توجه قرار گرفته است. در این تحقیق از الیاف شیشه به طول 12 میلیمتر و با مقدار 3/0 درصد وزن کل مخلوط به منظور بهبود عملکرد مخلوط‌های آسفالتی گرم استفاده شده و با استفاده از دستگاه چرخ محرک در دو حالت خشک و مرطوب عملکرد شیارشدگی و حساسیت رطوبتی مخلوط‌های آسفالتی گرم حاوی الیاف شیشه مورد ارزیابی قرار گرفته است. همچنین در این تحقیق تاثیر پیرشدگی کوتاه مدت، بر رفتار شیارشدگی و حساسیت رطوبتی مخلوط‌ها مورد بررسی قرار گرفته است. نتایج این تحقیق نشان می‌دهد که استفاده از الیاف در مخلوط منجر به بهبود عملکرد شیارشدگی مخلوط های آسفالتی گرم می‌شود (افزایش 3/16 و 5/12 در شاخص پایداری دینامیکی) در حالی که تاثیر قابل ملاحظه‌ای بر حساسیت رطوبتی مخلوط ندارد. در نقطه مقابل اما تاثیر پیرشدگی بر مقاومت شیارشدگی و حساسیت رطوبتی نمونه‌های آسفالتی گرم مثبت ارزیابی شد. در پایان این تحقیق همچنین مدل‌های رگرسیونی برای پیش‌بینی تعداد سیکل متناظر با 20‌ میلی‌متر شیارشدگی با کمک شاخص‌های تراکم ثانویه، نرخ شیارشدگی و پایداری دینامیکی ارائه شده است. In this research, glass fibers in the length 12 mm and content of 0.3 percept by the total weight of mixture were used to amend the performance of the warm mix asphalt (WMA). Wheel track test was performed in two states of dry and wet on unaged and short-term aged samples. The post compaction, stripping inflection point, dynamic stability, final cycle, and the number of cycles corresponding to 12.5 and 20 mm rutting depth as well as rutting rate were employed to evaluate the performance of rutting resistance and moisture susceptibility of samples. The results showed that while the incorporation of glass fiber improves all the rutting resistance criteria, it has an insignificant impact on moisture susceptibility of WMA. On the other hand, short-term aging enhances both the rutting and moisture-damage resistance of mixes. Moreover, regression equations were developed to predict C-20 criterion from post compaction, dynamic stability and rutting rate criteria. -Abtahi, S. M., Esfandiarpour, S., Kunt, M., Hejazi, S. M., & Ebrahimi, M. G. (2013), Hybrid reinforcement of asphalt-concrete mixtures using glass and polypropylene fibers. Journal of Engineered Fibers and Fabrics, 8(2), pp.25-35. -Aschenbrener, T. (1995), “Evaluation of Hamburg wheel-tracking device to predict moisture damage in hot-mix asphalt”. Transportation Research Record (1492), pp.193-201. -Aschenbrener, T., & Currier, G., (1993), Influence of testing variables on the results from the Hamburg wheel-tracking device. -Bonaquist, R. F., (2011), “Mix design practices for warm mix asphalt (Vol. 691): Transportation Research Board. -Busching, H., Elliott, E., & Reyneveld, N., (1970),” A state-of-the-art survey of reinforced asphalt paving. Paper presented at the Association of Asphalt Paving Technologists Proc”. -Buss, A., Williams, R. C., & Schram, S. (2016), “Evaluation of moisture susceptibility tests for warm mix asphalts. Construction and Building Materials, 102, pp.358-366. -Chen, H., Xu, Q., Chen, S., & Zhang, Z. (2009), Evaluation and design of fiber-reinforced asphalt mixtures. Materials & Design, 30(7), pp.2595-2603. -Chen, X., Huang, B., & Xu, Z. (2007), “Comparison between flat rubber wheeled loaded wheel tester and asphalt pavement analyzer”. Road Materials and Pavement Design, 8(3), pp.595-604. -Cooley, L., Kandhal, P. S. Buchanan, M. S. Fee, F. & Epps, A., (2000), “Loaded wheel testers in the United States: State of the practice: Transportation Research Board”, National Research Council. -Doyle, J. D., & Howard, I. L. (2013), “Rutting and moisture damage resistance of high reclaimed asphalt pavement warm mixed asphalt: loaded wheel tracking vs”. conventional methods. Road Materials and Pavement Design, 14(sup2), pp.148-172. -Guo, Q., Li, L., Cheng, Y., Jiao, Y., & Xu, C., (2015), “Laboratory evaluation on performance of diatomite and glass fiber compound modified asphalt mixture”. Materials & Design, 66, pp.51-59. -Hicks, R. G., (1991), “Moisture damage in asphalt concrete: Transportation Research Board”. -Hurley, G. C., & Prowell, B. D., (2005), Evaluation of Sasobit for use in warm mix asphalt. NCAT report, 5(06). -Kiggundu, B. M., & Roberts, F. L. (1988), “The Success/Failure of Methods Used to Predict the Stripping Propensity in the Performance of Bituminous Pavement Mixtures”. Paper presented at the Presented at the Annual Transportation Research Board Meeting. -Kim, Y.-R., Zhang, J., & Ban, H., (2012), “Moisture damage characterization of warm-mix asphalt mixtures based on laboratory-field evaluation”. Construction and Building Materials, 31, pp.204-211. -Little, D. N., & Jones, D., (2003), “Chemical and mechanical processes of moisture damage in hot-mix asphalt pavements”. Paper presented at the National seminar on moisture sensitivity of asphalt pavements. -Mahrez, A., Karim, M. R., & Katman, H. Y. b., (2005), “Fatigue and deformation properties of glass fiber reinforced bituminous mixes”. Journal of the Eastern Asia Society for Transportation Studies, 6, pp.997-1007. McDaniel, R., & Shah, A. (2003), "Asphalt additives to control rutting and cracking". Moghadas Nejad, F., Azarhoosh, A., Hamedi, G. H., & Roshani, H., (2014), “Rutting performance prediction of warm mix asphalt containing reclaimed asphalt pavements”. Road Materials and Pavement Design, 15(1), pp.207-219. Punith, V. S., et al. "Effects of long-term aging on moisture sensitivity of foamed WMA mixtures containing moist aggregates Materials and structures”, 45.1-2 (2012), pp.251-264. Putman, B. J., & Amirkhanian, S. N. (2004), “Utilization of waste fibers in stone matrix asphalt mixtures”. Resources, Conservation and Recycling, 42(3), pp.265-274. Sheth, N. M. (2010), “Evaluation of selected warm mix asphalt additives”. (MS (Master of Science) thesis), The University of Iowa. -Terrel, R. L., & Al-Swailmi, S. (1994), Water sensitivity of asphalt-aggregate mixes: test selection. -Vaitkus, A., Cygas, D., Laurinavicˇius, A., Vorobjovas, V., & Perveneckas, Z., (2016), “Influence of warm mix asphalt technology on asphalt physical and mechanical properties”. Construction and Building Materials, 112, pp. 800–806. -Zelelew, H., Paugh, C., Corrigan, M., Belagutti, S., & Ramakrishnareddy, J., (2013), “Laboratory evaluation of the mechanical properties of plant-produced warm-mix asphalt mixtures”. Road Materials and Pavement Design, 14(1), pp.49-70.